Thus planting the islands is a kind of whimsical act of defiance by the garden clubs—a brave assertion of civic spirit against impossibly ugly spaces and the extraordinarily difficult horticultural conditions of the site. Overcoming these problems can be very satisfying for a garden club. When a group is able to work through the difficulties of public/private partnerships, design, installation and maintenance, the garden they build becomes a living celebration of their care for the larger community. On the other hand, the price of failure is high. Islands which were originally innocuous become eyesores when well prepared beds go to weeds. An invigorating symbol of civic pride and cooperation becomes a very public sign of yet another dispiriting failure to carry good intentions through. This island was designed by Mabel Maria Herweg for the Dedham Pride Committee. I like the way she uses yellow edged hostas and gold leaved spireas to pick up the gold in the sign and to contrast with the gray of the asphalt. The daylilies will also have golden flowers. The blueish leaves of the sedum add another interesting texture and color, as well as being guaranteed to survive in these difficult conditions because of their waxy cuticle! The first lesson I learned about designing successful traffic island gardens was the importance of asking—not telling!— civic officials what the garden club could do for them. A garden club which tries to impose its own agenda on elected officials or town employees is much less likely to have a successful project than one which asks what kinds of help will be most welcome. When garden club members appear to underestimate either the ability or the commitment of those they are seeking to work with, a project is doomed. As in any relationship, trust and mutual respect must be earned. A garden club which cooperates effectively with its town officials is able to reinforce the pride of both groups in the resulting planting and to create the best kind of civic feeling. A written memorandum of understanding is invaluable in clarifying for both the club and the town which group is responsible for each aspect of the project, from funding to design to implementation to maintenance. Starting with a planting plan drawn to scale, plant and materials lists showing quantities, sizes, and costs, and a well thought out maintenance plan can prevent many problems from developing later. Once a site is deemed sufficiently important for development—at a significant crossroad, or a long stoplight, or opposite a town hall or church— the designer must be sure that it can be planted safely. Site lines for traffic from every direction must be maintained. Some towns require choosing plants that will not grow higher than 18”’ in the 15’ from the curbs or shrubs higher than 3’ in the center of the island. An elevation plan showing each plant at its ultimate height should be approved by the appropriate civic official in the earliest stages of planning. 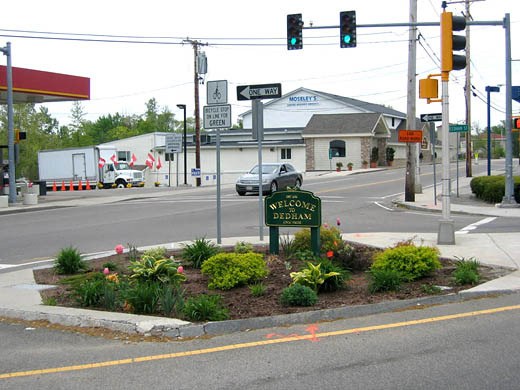 Planting schemes should take traffic conditions into consideration: a startling floral display is a poor choice for an intersection where drivers needs to concentrate on merging traffic. On the other hand, a bed of roses at a long stop light may remind a driver that getting home alive is worth exercising patience. Failure to plan in advance for on-going maintenance is the chief reason for failure of traffic island gardens. The garden should be designed according to a realistic assessment of the type and level of maintenance the club and its civic partner are willing and able to perform. If the group is going to be responsible for maintenance, can they reach the island safely by foot? Is there parking near by? Grass needs aeration, lime, fertilizer, reseeding, and regular watering and mowing. Trees and shrubs need mulching, fertilizing, watering and pruning. In addition to these needs, flowering plants need a spring and fall clean up, weekly watering, weeding and deadheading; annuals must be bedded out annually and perennials must be divided regularly. Even brick and concrete require regular sweeping to look cared for; cigarette butts, beer cans and Dunkin Donuts cups flung from cars make the best design look awful. Even the most xeroscopic planting requires watering until the plants are established. Can in-ground irrigation be installed? If the town has no watering truck, can the club arrange for watering with another group, or commit enough members to take care of the issue itself? Compared to the difficulties of arranging maintenance, planting islands is usually a straight-forward, happy process of mutual cooperation. Civic employees often do the heavy work of preparing the planting bed—removing the existing concrete or poor soil and bringing in enough good topsoil to support the kinds of plants the club has chosen. At least 18” of compost/soil mix will be necessary to hold the moisture needed to support plant life in such a bright, hot, windy environment. Club members often install perennials and annuals and do the mulching on small islands. A bus turnaround in Millennium Park in West Roxbury, MA. Plants include grasses and rudbeckia. Choosing suitable plant material for the site is essential. Even with good soil and available water, traffic islands are inhospitable places for plants. Rooting space is restricted, heat is reflected from pavement and vehicles, sand and salt are whipped against the plants by high winds, and exhaust pollutes the air. The most successful gardens use plants adapted for survival in seaside conditions—those with hairy leaves like artemisias and waxy cuticles like sedums are especially likely to survive. Because garden clubs are not constricted by the necessarily rigid schedules of park departments, they are able to avoid the municipal horticulture stereotype of bedding out low annuals. They can create mixed plantings of shrubs, perennials and annuals which feel like private gardens for the public. A list of tough plants which have worked well for many New England clubs is posted at http://www.smmgardens.com/civicplanting/tough-plants-handout.php. A gallery of images of these plants is posted at http://smmgardens.com/toughplants/toughplants.html. A list of trees and shrubs suitable for urban plantings compiled by Laura Eisener, MLA, is posted at http://www.smmgardens.com/homework. The style of an island planting should be sensitive to the degree of formality of the architecture and any large adjacent plantings in municipal or historic areas. Edgy, exciting styles using flamboyant tropical plants work beautifully in downtown New York City and Chicago, but feel out of place in village settings. A naturalistic style seems right in rural areas, while the more domestic perennial gardens seem at home in residential areas. Repetition of colors, forms and textures can be used functionally to link different parts of a city, to identify a business district, to harmonize with the colors of adjacent buildings, and to distract from ugly spots. Some communities choose a distinctive palette of colors and plants as a branding tool. The designer must consider who is expected to look at the garden. Tenants of tall buildings can appreciate the overall design of the garden, but not the details. The eyes of car occupants are 4.5’ above the street—when the car is moving the viewers can catch only broad effects—two colors or textures. Drivers can appreciate more detail at stoplights and in traffic jams. If an island is part of a pedestrian crossing, the planting can have more varied and subtler effects which can be enjoyed close up. Another issue in designing an effective traffic island garden is choosing suitable paving, monuments, and planters. As in choosing an appropriate style for the planting scheme, sensitivity to the surrounding architecture and plantings is essential in selecting the right paving for the site. Often this work is done around existing monuments whose materials and style must be respected. Again, the choice of planters depends on decisions made about the larger issues of architecture and paving. In rural and some residential areas, the time-tested whiskey barrel is hard to beat. In more sophisticated urban areas, built- in brick or granite planters seem more appropriate. Community service has always been at the heart of the garden club movement. The creative designs and hard work on traffic islands of our members have made innumerable cities, towns and villages not only more attractive, but more civilized and more fun. The gardens we make in these absurdly unpromising public spaces are evidence that we care about the greater community, not just ourselves. The hard work and humor and delight in life which we share with our communities make them better places for us all.